the stamp shows the flaw “Large Dent” in the bottom margin - cliche 25 of the sheet. It is the only cover I know with a pin-perforated stamp, European paper. All other covers of the first issue I know bear imperforate stamps. Does anybody know of another cover with a pin-perforated stamp, European paper? 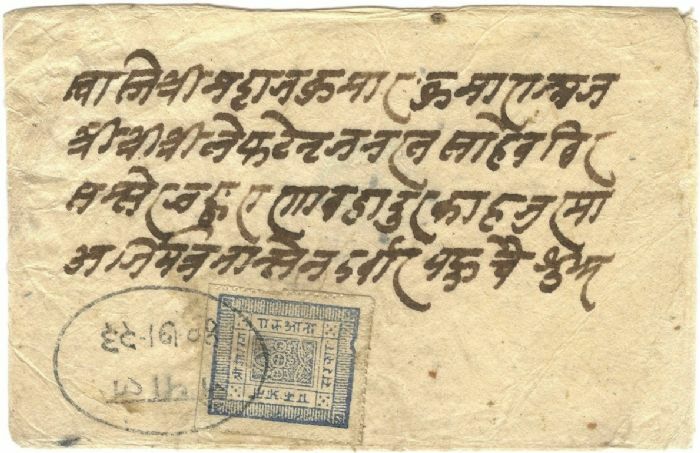 There is another cover with a pin perforated one anna pictured on page 26 of Hellrigl and Vignola's The Classic Stamps of Nepal The cover is described as the earliest know Classic Nepalese cover of the first printing and was posted on May 5, 1881 and belonged to Frank Vignola. I assume that his son now has it. yes, you are right. I did not notice the pin perforated stamp on this cover. Somehow the rarity of used examples and covers is astounding.